Kevin Harvick started third, finished first, collecting 10 bonus points and one playoff point. The Busch Light/Mobil 1 driver stayed out during the first two cautions on lap eight and lap 15. The No. 4 Ford came to pit road during the competition caution on lap 25 for two tires and fuel. Harvick restarted second on lap 27 and stayed in the lead for the remainder of the stage. He came to pit road for four tires and fuel at the end of the stage and came out fifth as the top-four cars opted to stay out. Started fifth, finished first, earning 10 bonus points and an additional playoff point. Harvick raced his way back up to the second position by lap 75, when he came to pit road under caution for fuel only. The Busch Light/Mobil 1 Ford raced up to third by the following caution on lap 85. The team chose to stay out under caution. Harvick restarted second on lap 86 and raced to the lead by lap 109 after a long battle with the No. 78. The Busch Light/Mobil 1 Ford won the stage and came to pit road for four tires and fuel at the conclusion of Stage 2. Harvick stayed out under caution on lap 140 to remain the leader. The No. 4 Ford surrendered the lead to come to pit road for a final time under green-flag conditions for four tires and fuel on lap 171. Harvick took the lead for good on lap 190 after the remainder of the field cycled through its final scheduled pit stops. Harvick’s margin of victory over second-place Brad Keselowski was 3.233 seconds. This was Harvick’s 44thcareer Monster Energy NASCAR Cup Series win, and it ties him with Bill Elliott for 17thon the all-time NASCAR Cup Series win list. This was Harvick’s 21stMonster Energy NASCAR Cup Series victory since joining Stewart-Haas Racing (SHR) in 2014. Harvick became the first driver since 2008 to win seven of the first 23 races in a season. Kyle Busch scored all eight of his 2008 victories in the season’s first 22 races. This was Harvick’s series-leading seventh victory of 2018. It was also his 17thtop-five and 19thtop-10 finish of the season. Harvick earned his second victory in 36 career Monster Energy NASCAR Cup Series starts at Michigan. It was also his 12thtop-five and 17thtop-10 at the track. Harvick led five times for a race-high 108 laps to increase his laps-led total at Michigan to 480. 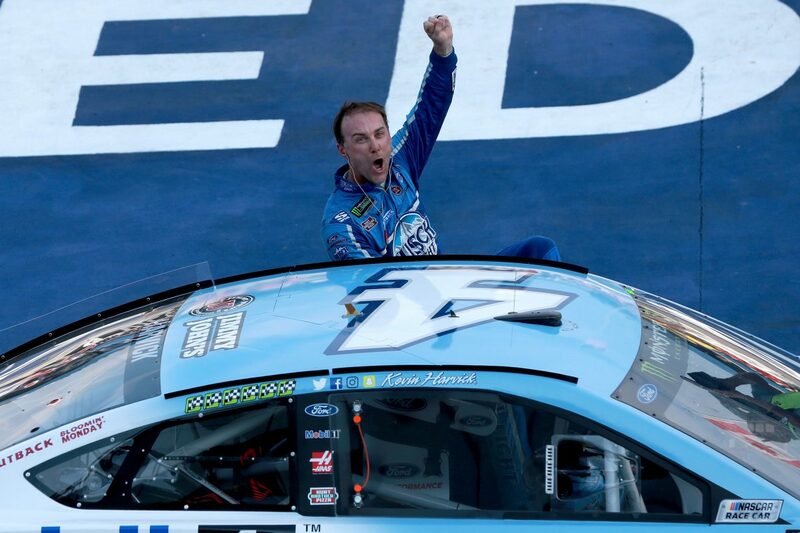 Harvick’s victory in the Consumers Energy 400 marked the 53rdoverall win for SHR. It was the organization’s 48thpoints-paying Monster Energy NASCAR Cup Series win and its third at Michigan International Speedway in Brooklyn. Harvick’s win marked SHR’s series-leading ninth points-paying victory 23 races into the 2018 season. SHR also won the 2018 Monster Energy NASCAR All-Star Race via Harvick. Twenty-one of the 40 drivers in the Consumers Energy 400 finished on the lead lap.